One thing - amongst many - that I've always been especially self-conscious about, is my very fair skin. When I was younger, I spent many hours trying to achieve that 'ever so natural' - yet completely fake - sun-kissed, beautiful brown glow. I don't think I ever really achieved it. If I tried to do it the natural way, I'd end up burnt and if I tried to get it from a bottle, I'd end up orange! Well, as I've gotten older, I've managed to come to terms with the fact that I am just plain fair, and there's not a whole lot I can do about it. Because of how fair I am, I've always shied away from using bronzers. However, a while ago on a trip into town, I found myself being talked into trialling one of Kit Cosmetics' beautiful bronze options. 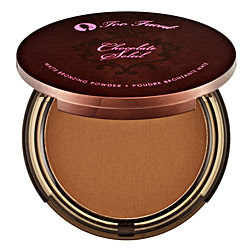 The one I tried was the Too Faced Chocolate Soleil Matte Bronzing Powder. The makeup artist explained to me that for skin as fair as mine, the key is really to use a small amount and blend, blend, blend! I was so pleasantly surprised by this gorgeous powder. The tiniest amount, blended thoroughly into my skin, created a soft - yet noticeable - glow. Of course I walked away with this nifty little discovery in my shopping bag, and I've loved it ever since! The best part - it's made with real cocoa powder! It smells divine, and although I haven't tried it - I'm told it tastes equally amazing!